Talk of Humboldt Bay stokes nostalgia among locals who remember it as once being the county’s flagship industrial source, but the dialogue Wednesday at the Samoa Cookhouse was modeled around shaping the harbor’s economic future. “Our goal is to work with the private sector to bring great jobs,” said Humboldt Bay Harbor, Recreation and Conservation District executive director Larry Oetker. Oetker addressed a roomful of locals comprising the Humboldt Bay Harbor Working Group, a grassroots community organization that explores ways of revitalizing the harbor. Among the major plans is rebooting the shipping industry, but to do that, the harbor must evolve into a year-round site of industry, Oetker said. Currently, the bustle around Samoa is slow, since the winter months bring weather that makes shipping work untenable. Oetker stressed the need for a long-term solution to natural processes like sediment deposits from the Eel River that fill up around the entrance to the South Jetty. The sediment creates the danger of shoaling, or a shallowing up of the water that puts crabbing boats facing larger waves in peril. “We need to do a long-term study with engineers and find a long-term solution,” he said. Offshore wind energy at the bay is another one of Oetker’s visions. “Giant” wind farms at the very end of Humboldt Bay could make the harbor an energy hub of Northern California while avoiding the businesses set up there, he said. Pete Oringer, a Working Group board member, said he’s visited various Western European countries in the past year and noticed wind turbines there. “They’re putting their money there; they’ve done the due diligence,” Oringer said. He encouraged people to put their money toward the harbor in order to do the same. Describing himself as a dreamer, Oetker said that attracting businesses to the harbor should fall into Humboldt County’s lap, since, unlike bays in other major areas, the county doesn’t have existing infrastructure that obstructs viable shipping channels. Oetker pointed to different areas nearby the Port of Humboldt. If those areas had the necessary infrastructure, he said, then many more businesses could begin setting up shop there. The costs of building would be offset by the ensuing property tax revenue, he said. The harbor district is nearing the end of a process completed with the county Planning Commission in order to permit businesses at the Samoa pulp mill that previously weren’t allowed to be there, since the area is set aside for coastal-dependent industry. The permits are valid for around seven years, Oetker told the Times-Standard, but if coastal-dependent businesses come around, those permits could be overturned. The meeting carried a spirited sense of urgency to start improving Humboldt Bay as soon as possible. Harbor District commissioner Richard Marks said the energy comes from the possibility of offshore wind energy. The company TerraGen has proposed building dozens of wind turbines in the Scotia area. Due to heavy winter storms, severe shoaling occurred at the entrance of Humboldt Bay. At that time Humboldt Bar Pilots temporarily reduced the deep draft limit to 25ft. based on a +6.0 ft. tide until maintenance dredging could be preformed. The Manson Dredge Bayport arrived at Humboldt Bay on the 17th of May and successfully started dredging operations that made vessel transit in and out of Humboldt Bay much safer. The Army Corps of Engineers Dredge Essayons relieved the Dredge Bayport on June17th and effectively dredged the Approach and Entrance Channels. The Dredge Essayons departed Humboldt Bay July 1st and will return to finish dredging in September. With new sounding information the Humboldt Bar Pilots are increasing Deep Draft Limits to 38ft. based on a +6.0 ft. tide with a restriction of Day Light Operations for Vessels with a Deep Draft of 35’ to 38’. Once new soundings are received draft limits may be adjusted if necessary. If I can answer any questions or help in any way, please contact me at the number listed below. The Harbor District recently raised slip fees and began charging for electricity at Woodley Island Marina, a move that has angered some. The district says it was necessary to stay solvent. There's no question Humboldt Bay is one of our most crucial resources. But depending on whom you ask, you'll get a different reason as to why. Maybe it's those kayak trips on calm days around the bay's islands. Maybe it's the deep water port that offers so much shipping potential. Maybe it's the crab harvest each fall. Maybe it's the wildlife that flock to its banks. Economic Potential of Humboldt Bay's Deepwater Harbor Asset was presented by David Hull of David Hull and Associates and former Chief Executive of the Humboldt Bay Harbor, Recreation and Conservation District at the April 12, 2012 Jobs Forum in Eureka, California. Presentation details the economic potential of revitalizing Humboldt Bay's harbor. The race for two seats on the Humboldt Bay Harbor, Recreation and Conservation District Board of Commissioners this November is being run by a diverse set of candidates from varying occupations: a nurse consultant, a shellfish company operations manager, a business consultant and a fisheries biologist. All four candidates gathered for a forum at the Samoa Cookhouse on Wednesday afternoon to introduce themselves, voice their goals and plans for the district’s future, and to challenge statements of their fellow candidates. Sponsored by the Humboldt Bay Harbor Working Group, the forum had each candidate answer three questions: how they think the district should operate, their vision for Humboldt Bay as compared to the county’s and local cities’ visions, and solutions to financial issues they see are currently impacting the district. Trinidad resident Susan Rotwein — a nurse consultant and commercial fisherman challenging incumbent Patrick Higgins for the 5th Division commission seat — said that the district must promote and protect the interests of the local communities and industries. To increase local jobs and improve the economic vitality of the harbor, Rotwein said the district should focus on attracting commercial fishing fleets and boats to the harbor and improving or creating facilities such as docks and storage facilities to accommodate them while adapting to issues such as sea level rise. She disagreed with the district’s request to Eureka to change land use zoning on 17 acres of Woodley Island to allow for more commercial uses, and disagreed with district’s stand that it would not negatively impact the local fishing fleet. “I do not favor any zoning change that would push the fishermen from their home on Woodley Island to another location,” she said. Eight-year incumbent Patrick Higgins — a fisheries biologist and Eel River Recovery Project managing director from McKinleyville — said that the harbor district can continue to avoid financial distress by diversifying its ports, expanding the aquaculture industry, and stimulating the tourism market through creating an interlinked trail system and even a railroad around the bay. “We are making progress on all these fronts and there is a bright future, if we stay the course,” he said. Higgins also endorsed his fellow commissioner Greg Dale, who is currently seeking reelection for the 2nd Division seat. Higgins said that to elect Rotwein or Dale’s challenger Nick Angeloff would “reverse course” on the economic improvements being made to the district. “I’m proud of our record,” he said. Angeloff, a business consultant and Rio Dell Planning Commission chairman, said the district must focus on its mandate to allow existing industries to develop jobs. For the greatest return, Angeloff said the harbor must refocus its efforts on creating a viable shipping port, and stated that the district must do more outreach to other parts of the state — specifically mentioning the agricultural industry in the Sacramento Valley area — to diversify the products shipped in and out of Humboldt Bay. “Without shipping, all the mandates of the district will be at risk in the next decade,” he said. Angeloff questioned whether the district truly captured the expenses it would incur for loans and a recently made settlement agreement with the Environmental Protection Agency regarding repayment of the ongoing Samoa pulp mill emergency cleanup, as well as the recently purchased dredge. If elected, he said he would call for a financial audit. “Moving forward, we need to turn this ship around and get the harbor working again,” Angeloff said. Dale — a Fortuna resident and operations manager for Coast Seafoods Company — said that the district had attempted to market its ports for nearly 15 years, which nearly brought it into bankruptcy due to the lack of returns. He said he is not against a large industrial port, but stated that businesses that establish themselves in the county and ship their products from the county will provide the most benefit to the area through jobs and revenue. “It’s just going to be very difficult to do a marine highway here,” he said. But with the district’s shipping revenue having reduced throughout the last 50 years, Dale said it must also diversify and play to the county’s industrial strengths in biomass, oysters and fishing. Eureka Realtor Larry Doss, the unopposed candidate for the open 1st Division commission seat, was present to watch the debate. The election will occur on Nov. 3. In many ways, things were not looking good for Humboldt Bay in the late 2000s. The economy had tanked, the pulp mill had closed and shipping had dwindled. Locals began to realize that sea level rise was a threat to the surrounding communities. The Humboldt Bay Harbor, Recreation and Conservation District, a relatively quiet, unrenowned public agency tasked with overseeing the bay's waters and tidelands, was trying to figure out what to do. The district has taken bold and unprecedented steps in recent years. Under the leadership of Executive Director Jack Crider, it acquired a major piece of property, expanded its fishing infrastructure, is getting closer to a balanced budget, and is planning more developments, all the while increasing public transparency. But with an election looming, three of the district's commissioners could change. There are questions about how the district should view itself, about whether it's been too ambitious or drifted away from prioritizing the harbor and industries that rely on it. The district could be on the edge of a philosophical shift. 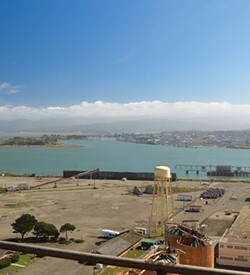 The Harbor District's boldest move was its acquisition of the Samoa Pulp Mill, which sat dormant since Evergreen Pulp abandoned it in 2008. Freshwater Tissue Company purchased the site, but was never able to secure the necessary funding to re-open it. The sale of the defunct mill to the Harbor District in 2013 was met with some wariness — millions of gallons of caustic liquors used in the pulp-making process sat in failing tanks on the site. And, while the district owned several properties around the bay, none were of the scale or level of disrepair of the pulp mill. It was new territory for the district to take over such a large piece of infrastructure and become responsible for its cleanup, repairs, maintenance and rent. The Harbor District quickly enlisted the aid of the Environmental Protection Agency, which secured funding and, in 2014, began hauling away the liquors and the decaying tanks that housed them. (See "Liquor Run," March 27, 2014.) While the district purchased the property for only $1, it needed capital to fund the cleanup and renovation of the site and secured a $1.25 million loan from Coast Seafoods and another $8.5 million from the EPA, which led the cleanup process. If the district manages to sell large pieces of infrastructure from the mill, like the boiler or generator, it will use that to pay back the EPA. Otherwise, the $8.5 million loan will be forgiven in seven years. Activity at the mill property has continued in the wake of the cleanup, though the district's had a bit of trouble securing leases for the 72-acre site. That's because the land is zoned coastal dependent — meaning any business that wants to set up there has to prove it relies on the ocean. Crider says he's had serious talks about the site with at least a dozen businesses, including companies interested in fiber optics, trucking, recycling, cold storage and growing cannabis — but the zoning roadblock remains. Crider says he's asking the county to allow some temporary non-coastal dependent uses so the district can get some tenants until it finds someone to fit the requirements long term. What counts as a coastal dependent business? "Aquaculture is good. Commercial fishing is good. A cargo operation is good. Export and import from the docks is good. Other than that it's pretty difficult," Crider says, adding that, being a public agency, the Harbor District is under the microscope when it comes to following zoning laws. Another concern for investors, Crider says, has been the environmental welfare of the site. "Every banker that's wanted to invest — every tenant — they're all concerned about the environmental condition," he says, which has required "a lot of hand holding." Crider says the local water quality control board has helped the district show some potential tenants that the pulp mill is a clean enough site at which to operate. Now, less than two years after the first trucks hauled the pulping liquors north, the district is on its way to earning $1 million per year in revenue from the site. Two oyster farming operations have already leased space. Taylor Mariculture has committed to invest $2.5 million into the pulp mill site, and has already built a number of flupsies — floating oyster beds that secure to the former mill's dock. Coast Seafoods will probably end up spending more than Taylor, maybe $3 million, Crider says, as the company will have a bigger footprint on the site, including a 20,000 square foot hatchery that includes a greenhouse to raise the algae that oyster larvae consume. Coast Seafoods currently pays $50,000 a year to lease space at the pulp mill, but, when all of the infrastructure is built, will pay $136,000 per year. Taylor pays $80,000 currently, with an option to grow and pay an additional $45,000 per year when it's finished investing in site improvements. Humboldt Bay companies sold $9.3 million worth of shellfish in 2010, according to a survey, and aquaculture made up 30 percent of the North Coast's total $31.4 million in seafood landings. The industry has since grown, and the Harbor District has been discussing pre-permitting oyster operations on 550 acres, which is expected to create 55 jobs and generate $265,000 per year in revenue for the district. In a less edible development, Samoa Wood Pellets is close to signing a $60,000 per year lease to set up a pellet manufacturing plant on the site, and has committed to $30 million in improvements to the pulp mill, after a recent two-hour conference call in which the investors were finally satisfied with the environmental condition of the site. By the time the company is running at full steam, it will be paying $400,000 per year. And Crider expects hauling raw materials in and sending processed pellets out of the bay will raise $400,000 in shipping revenue for the Harbor District. The companies could reach full production by 2018, if all goes well. If the already secured return on investment seems like a positive development, Crider anticipates a lot more revenue will come flowing out of the mile-and-a-half-long marine outfall pipe, which begins at the pulp mill and could deposit treated wastewater into the Pacific. In addition to the site's aquaculture discharge, Crider says businesses and municipalities like Eureka could use the outfall, generating "significant" revenue for the Harbor District. There's also still a lot of office and shop space to be rented, and Crider says the district is looking to borrow $1.5 million based on federal tax credits it recently qualified for to improve buildings on the site and make them "actually look like a building you want to rent," he says. Also in store for the bay is a new dredging plan. The Harbor District paid $17 million in 1999 to deepen Humboldt Bay's entrance, and has an ongoing contract with the Army Corps of Engineers to maintain the channel. The project was both a response to safety concerns and aimed at encouraging shipping, and the Harbor District is still paying off loans it took to begin the dredging. Paying down those loans has been slower than the district anticipated, because the tonnage moving through Humboldt Bay plummeted after the recession of 2008, severely hampering the harbor district's income. Since then, the district has been grasping onto the Army Corps' yearly dredging, lobbying the agency to continue the work. Typically, Crider says, the Army Corps wouldn't invest the $3.5 to $4 million per year it takes to maintain the entrance for a port that sees so little shipping, but the safety of the fishing fleet that comes in and out of the bay and the Coast Guard's presence help. Plus, Crider says, tonnage is going up, albeit slowly. Part of the reason shipping has survived on Humboldt Bay has been due to an $8 million investment by Green Diamond in a wood chip loading facility, just south of the former Samoa Pulp Mill. Since July of last year, says Green Diamond Forest Policy and Sustainability Manager Gary Rynearson, the company has shipped 154,000 green metric tons in four ships, and plans to load two more ships this year. "The Harbor Commission and the staff have been very supportive of promoting the need to maintain the entrance channel at 48 feet," a depth that makes it possible for large ships to safely enter and exit the bay, Rynearson says. Last year Green Diamond was forced to cancel a shipment after winter storms filled the channel with sediment. Because of a contract dispute and damage to the Army Corps' dredge, scheduled clearing of the channel appeared to be in jeopardy, and the channel had filled to 44 feet due to a lack of maintenance since 2011. But partnered with the Harbor District, county board of supervisors and representatives from Congressman Jared Huffman's office, Green Diamond was able to convince the Army Corps to complete the work in May, and the company's chip sales have resumed. Rynearson says the company's chip dock has opened new markets, and it is looking at overseas opportunities for tanoak chips and biomass. "These market opportunities are dependent upon a reliable port with an adequate year-around channel depth," he says. A 2015 grand jury report identified deep harbor dredging as "crucial to allow navigation for large ships." The report encouraged the district to continue its lobbying for federal and state funding to continue the Army Corps dredging. Smaller scale dredging is slated to begin soon as well, but hasn't been without controversy. Last year, the district arranged to take over Pacific Gas and Electric Company's obligation to dredge the channel in King Salmon in exchange for a one-time $2 million payment from the company. The district used a portion of that money to purchase a dredge, which it's in the process of repairing. It's fine-tuning a mitigation plan for south bay eel grass, with the intent of beginning dredging again in the King Salmon channel. Crider says the area hasn't been dredged since the 1980s, and is choked with sediment and eel grass, a situation that threatens the viability of the fishing fleet there. If the district can't get approval for the King Salmon channel in time, Crider says it will begin dredging the Eureka marina across from the pulp mill site this year and focus on King Salmon next year. Owning the dredge will also allow the district to clear the channel to Woodley Island Marina, though Crider says it isn't in as much need as other parts of the bay. That small-channel dredging is one of the most crucial things for the fishing industry, says Harbor Commissioner Aaron Newman, who's also president of the Humboldt Fishermen's Marketing Association. He says purchasing the dredge cost one-third the amount it would take to contract out the work one time. But there's been frustration from the fishing community because dredging hasn't begun. "They see we've got the dredge, they see we've got the money," he says, but "It's a maze of bureaucracy." The district is waiting on Fish and Wildlife approval to dredge and Coastal Commission approval to dump the material gathered on Harbor District property. Both Newman and Crider are confident dredging will begin before long. Still, it's not without risks. While it appears that the costs of owning a dredge will pencil out, the district is betting that it will be able to operate and staff the dredge as well as navigate the permitting maze. In the meantime, Newman says, "People are going out there spreading rumors that we're not doing our best. We're doing everything possible. There are so many details to work out." The Harbor District has been the target of some in Humboldt's fishing industry since it formed in 1973. That's when the city of Eureka and the district formed a plan to move Eureka's large fishing fleet off the docks that lined the south side of the bay, nestling up against Old Town. The move was based on the city's efforts to buy up waterfront property. It was motivated to "clean up" the Old Town area and open it to a wider range of economic opportunities. With the creation of the Woodley Island Marina, the fishing fleet was given a new home, but some in the industry feel the Harbor District hasn't been holding up its obligation to protect the fleet, instead focusing on commercial developments and other non-fishing departures. Perhaps the loudest voice of disgruntled fishermen is Newman's vice president of the Humboldt Fishermen's Marketing Association. Ken Bates has for years opposed changes on Woodley Island that he characterizes as jeopardizing the fishing industry, and has rallied community opposition to a number of projects proposed and carried out by the district. In 2013, Bates rallied support for changes to the city of Eureka's local coastal plan that would have limited development on Woodley Island for anything but the fishing industry. In a letter to consultants helping design Eureka's economic development strategic plan, Bates wrote that "present trends to erode fishing fleet protections" could include opening up dock space to recreational vehicles and lead to a "total buildout" of upland island property with restaurants, shops and offices, encroachment into the protected wildlife area. This, he warned, could lead to the removal of commercial fishing gear storage and a loss of fishing infrastructure. And, he wrote, the fishing fleet is leaving because uncertainties about losing that infrastructure. On a recent afternoon, there wasn't a lot of activity at the Woodley Island Marina. Most fishermen the Journal approached declined to talk, saying they kept their focus on fishing and not politics. One boat captain, who declined to give his name, said it was the first time in years he'd berthed in the marina. He'd left because the Harbor District raised slip fees and he felt that Crider, in particular, was driving the fleet away. In 2013, slip fees went up 25 percent, an increase of about $50 per month for the average vessel, Crider says. Slip fees will go up 1 percent this year, and the district is also imposing a $100 yearly fee for permits to sell fish directly from boats. Combined with some other changes, Crider says the district reduced the marina's yearly losses from $275,000 to $30,000. But Newman says the fishing fleet has been, and will continue to be, protected. "Fishermen, of course, are being well looked out for," he says. The district raised slip fees because the operating budget for the marina was well in the red. The district also installed electricity meters and began charging renters for their energy use, another point of contention. But Newman says that not only reduced the costs to the Harbor District, it reduced energy use by 40 percent. "The harbor wasn't being run in a way that could be continued," he says, adding it was only a matter of time before the district went bankrupt. It's far more important to raise rents a bit and keep the facility open, he says, than to risk the marina shutting down. And the district has invested in the industry, recently opening its Terminal 1 to the fishing fleet. Right next to the Samoa Cookhouse, the property is further back in the bay where there's more sediment, making it less desirable for container shipping, "so the best use is to support the commercial fishing industry," Crider says. About 100,000 pounds of hagfish have already been processed in the facility there, Crider says. Newman says the area should provide plenty of space for the beginning of crab season (scheduled for Dec. 1), which is usually hectic for Woodley Island. The district is also eyeballing the terminal for a potential cold storage site. Crider has been responsible for most of the changes on Woodley Island, Newman says, and he's finally getting close to balancing the district's budget after years of losses. "He's been doing the right thing," Newman says. "We're trying to make our facility sustainable to provide for the needs of commercial fishermen." A common refrain among the challengers to the Harbor commission's incumbents this election season has been that they have lost sight of the Harbor District's mission. That there's been too much focus on conservation and recreation, despite their making up two-thirds of the agency's title. But Crider says he feels there hasn't been enough energy put into the district's conservation efforts. "There are a lot of opportunities I haven't been able to take advantage of," he says, including conservation grants and programs. He chalks that up to a small staff that's been busy lately with the mill site and new dredge. "The bottom line is, it's good for the bay, good for the health of the community to have those programs here," he says. But Humboldt Baykeeper Executive Director Jen Kalt says Crider is underselling the Harbor District's accomplishments — the biggest being the pulp mill cleanup. "If that property was still in private hands it would still be sitting there," she says. "That was a tremendous accomplishment for the bay." The district has also taken the lead on efforts to control and eradicate spartina, an invasive grass that's spread through nearly all of Humboldt Bay's salt marshes, outcompeting native plant species and harming the wildlife that rely on them. The district also took steps to eliminate stormwater runoff at its Fields Landing boatyard, Kalt says, reducing the impacts of silt and pollutants that flow into the bay. She says the dredge plan is better than it's been in the past, incorporating information about the bay's dioxins in a way that hadn't been done in previous years. And the district's openness and transparency, she says, have improved greatly over the last decade. Baykeeper no longer has to fight for public records. The district has also taken steps to digitize its public process, posting its agendas online and offering video recordings of the commission's meetings. Kalt says the Harbor District has done sea level rise adaptation work, but would like to see the agency take the lead on the next step: creating a comprehensive action plan that would prioritize the areas on the bay that need work on dikes or tidal restoration projects. So much of the property is privately owned that conservation and restoration projects are occurring where there are willing landowners, Kalt says, not necessarily where those projects are most needed. Crider would also like the district to be more involved in preparing for sea level rise, wildlife studies and water quality improvements. He says there are a lot of debris removal and construction projects related to conservation, which could bring in revenue and create jobs on the bay. But to do that, he needs more staff. He doesn't want to just write grants and then contract out jobs to consultants. "I would like to participate more than being a flow-through agency." Newman shares a particular frustration over the last several years: simultaneous complaints about the Harbor District doing too much, and doing too little. The same grand jury report that urged the district to keep up its dredging efforts also stated that, when it came to economic development, the district should essentially keep up the good work. Citing the purchase and improvement of district properties, a pre-permitting plan for oyster farms, and development plans for Woodley Island, the grand jury wrote that "the Harbor District has been successful in generating new revenue streams and stabilizing finances." The Harbor District has been an ambitious governmental agency lately, expanding its scope and bringing itself closer to financial solvency. Whether the vision of its commissioners will last beyond the end of the year is unclear, but both Humboldt Bay's untapped potential and the fate of its existing maritime industry lie firmly in the district's hands. August 27, 2014. Following his speaking engagement at Samoa Cookhouse, Andrew Sturmfels, Senior Permit Assistance Specialist, State of California, toured Humboldt Bay Harbor. Helping him to understand key features and issues around the harbor are at left, from front to back: Chet Albin, Sid Berg and Leroy Zerlang; on the right, from front to back: Dave Hull, Andrew Sturmfels, Marian Brady, and Kevin Hamlin. Others on the tour but not shown in the photo include: Karen Brooks, Larry Henderson, Richard Lentz, Susana Munzell, Pete Oringer, Monte Provolt, Dave Schneider, Ryan Schneider.